Stop Bashing Sarah – It’s Not Her Fault!!!! I’ve had just about enough of the Sarah Palin bashing. She is not at fault for McCain losing the election. the fault is McCain’s staff. The electoral college may seem like a landslide victory for Senator Obama but many of the battleground states were really close. Governor Palin is the reason why it was so close. Without Governor Palin, Obama would have completely wiped the floor with McCain. To use Trucker Randy’s term…. THAT’S A LOAD OF CRAP!!! Remember that John McCain was not popular at all with the Conservative base of the Republican Party. They were scattering either to Bob Barr, Charles Baldwin, or deciding to just stay home. things changed in an instant with McCain’s selection of Governor Palin as his running mate. If it were not for the financial crisis that move might have won McCain the White House. Even after the crisis having Palin on the ticket kept the race close and got enough Conservatives to the polls to keep the Democrats from gaining a super majority in the Senate down ticket. If there is any blame to go around it has to go to McCain’s staff and advisers. they did not allow McCain to be the man he was when he gained popularity in 2000. He only really got to show it during his concession speech. For all intensive purposes it was way too late. His staff also needed to use his surrogates more wisely. In many of the battleground states that McCain lost Mike Huckabee was popular and he was rarely used, if ever. He could have won those states (like Ohio and Iowa) for McCain by himself if allowed to stump for the ticket more often. Also I believe pulling out of Michigan was a fatal error. I think the ticket had a better shot to switch the map there than in Pennsylvania. The move had me and many others scratching our heads. The move handed Michigan to Obama on a silver platter and hurt races down ticket and cost Republicans in the state dearly who could have done better on the coattails of McCain/Palin. However after some thinking the move makes sense. Who is the de facto force behind Michigan’s republican Party and who had a large presence among McCain’s staff? That’s right, Mitt Romney. Why else would McCain’s staff be bashing Governor Palin, especially because she could be a threat to the former Governor in 2012? So stop bashing Governor Palin! She inspired a lot of Conservatives during this race (including myself). She provided a lot of excitement and muscle to the ticket and she is a rising star in the Republican Party I look forward to more great things from her. God bless Palin, her husband, and her wonderful children! Last night was really rough for Conservatives as Senator Barack Obama became President-Elect and the Democrats increased their majorities in the House and Senate. The only good news for Republicans is that the Democrats will fail to get their super majority. Stay tuned for further analysis but I just have to come out and say it. Let’s ignore what he stands for and the direction he wants to take our country in. Americans have spoken in a loud voice and have done something never thought possible decades ago. In January our first Black president will take office, only forty five years after they gained the ability to vote without fear. I don’t applaud Barack Obama’s stance on the issues but I have to applaud him for his great victory. He also gave a great speech after he clinched victory. Say what you will about our next President but he can deliver a speech that can evoke emotion. I even shed a tear thinking about the many people that went to the polls yesterday to vote for a Black man after they had lived through the awful and despicable days of Jim Crow. Speaking of great speeches, John McCain’s concession speech was very gracious and very well done. In a very tough year and climate for Republicans McCain/Palin did probably as well as could be expected because they were really sailing into gale force winds. Obama and the Democrats outraised and outspent them by huge margins. It’s no small wonder that they did as well as they did at the end of the day. When I voted yesterday I went with my youngest brother. My first election was in 2000 and I will never forget the experience. Before going to bed last night I did something I normally don’t do. I popped in his room and talked with him. I wanted him to understand the significance of what we had just been a part of. I hope that while neither of us wanted the result that we ended up getting, that he remembers this day for the rest of his life, I know I will. Why Are We Having A Debate Tonight? I have one simple question. WHY ARE WE HAVING A DEBATE TONIGHT???? Our nation is in economic and financial crisis and it is not being helped that the two major Presidential candidates are sitting Senators. As I understand it at this hour there is no solution to the problem. The deals have not been finalized yet. So you send the two sitting senators out to Oxford Mississippi to a debate while they should be holed up with everyone else on Capitol Hill until a consensus solution is agreed upon?! ARE YOU KIDDING ME??? Yes this whole issue has been politicized all week long but it should not be up to McCain or Obama whether the debate is held. This debate should have been postponed by the people in charge until a solution is reached on the current crisis because both of them should be a part of the solution, no matter if we agree with the solution or not. But hey would you expect anything less from the hate-America mainstream media (yep Fox News you are part of the problem too) that runs these debates? This is par for the course for these morons! Thanks a lot for being part of the problem and leaving our nation’s economy and finances in a bind. GOD BLESS AMERICA…ISN’T THIS WONDERFUL??? I need YOU to do me a personal FAVOR!!! side of the home page. If you agree, please click on the “Join Today!” link. scroll down and put me “Bishop, Trucker Randy-Traverse City, MI” as your recruiter. Check the “I agree” box and then click the “Join!” button. time that is available for me to do the most important things first. Take a moment and reflect on the amount of time you spend online every day. Country back from the liberals and their media!!! ask them to go online whenever they can, and call you back once they are online. When they open the homepage, ask them if they have joined in the past. asking Bill to change their “Recruited By” to your name. If they haven’t joined before,…go to the next step. of the left side of the home page. vote for Jack Hoogendyk to replace Senator Carl Levin in the U.S.
h) Then ask them to read the statement below the “Recruited By:” box. statement”,… and then have them click the “Join!” button. your names, using those three questions you used to make your list. “Call to Arms” e-mail message!!! WHY AM I ASKING YOU TO DO THIS??? We need to take our Country and the State of Michigan,…back from the direction it’s going!!! We need to defeat Obama/Biden and make sure that the McCain/Palin ticket wins!!! We need to make sure McCain picks the next Supreme Court Justice,…not Obama!!! We need to replace Senator Carl Levin with Jack Hoogendyk. Michigan needs your help!!! some national media attention about our Grassroots Coalition’s efforts. some money from them for Jack Hoogendyk’s campaign against Carl Levin. they (the National GOP) do not think that Jack can beat Carl Levin. We are going to replace Carl Levin,…this year!!! can take out a very powerful and rich liberal incumbent in the U.S.
Senate, while putting McCain/Palin in the White House!!! Mike Huckabee is coming to Michigan to do a fundraiser for Jack Hoogendyk on OCTOBER 22, 2008. I am personally picking Mike up from the airport and taking him to this event. My plan is to print out the website’s list of names and give the list to Mike personally. I hope that we can show Mike what we have done as his supporters. I think his heart will be touched knowing what we have done for our Country. something that can really make a difference in this year’s election. exact same “Call to Arms” plan!!! are going to make a difference in the outcome of this election!!! Thank you for doing me this personal favor!!! P.S. I know times are tough. Fuel prices are killing me, too. and donate $10 to Jack’s campaign, and ask the people on your list to do the same? $10, we can help Jack, like Mike is. Thanks again for doing me this favor!!! It is currently 9:47 AM Eastern. As soon as the show starts and thereafter I will update this post as we go along. It’s going to be a fun morning. Stay tuned! 9:57 AM – We are just minutes away from the show. Local host Herman Cain just finished his 1 1/2 hour fill in for Neal and will pass the baton to Huck after the news. DON’T TOUCH THAT DIAL!! 10:05 AM – Weather and Traffic will soon be replaced by the winner of the Georgia GOP Primary, FairTax supporter, and my hero and champion Governor Mike Huckabee!! 10:22 AM – We’re back! “I wish term limits could get rid of some of these people.” If in charge he would support term liomits for Congress and he says it might give a better chance to pass the FairTax because the people in Washington would not be power hungry. A caller asked about the Bush tax cuts and he commented on how great they were but pushed the FairTax for a more permanent solution. Mike says now the harder you work and the more money you make the more you are penalized you are under the current tax system. “Let’s not penalize hard work. There is a long line of callers. My friend Don Williamson has now called in and he explained to Mike, John Oxendine’s efforts to pass the FairTax via Constitutional conventions and Mike supports it. whole heartedly. Don goes on to explain the true impact of the Huckabee Republican movement and how supporters are now running for local office. 10:30 AM – NEWS BREAK Mike is doing a fantastic job. Between this and filling in for Paul Harvey occasionally he is now having an impact on the radio like Ronald Reagan did. People seem to be interested in talking to him because the phone lines are packed to the gills! Keep up the great work this morning Mike! Also notice that he is spending a lot of time talking about the economy…he did not have a lot of time in the spotlight to talk about these issues and was hurt by it when he was running for President. 10:35 – News is ending and Mike is coming back on the air. “I’m on a high horse today and I’m not going to get off!” He doesn’t mind the guy at the top getting a nice paycheck but it shouldn’t be disproportionate to the workers and he shouldn’t be paid for failure. Airline workers are working really hard and it is not fair that their employers are being paid to drive the companies into the ground. Mike gives stas on how bonus have increased while revenues are not increasing too much. Mike esplained that this is not a good way to run your business. The next caller Steve asked a question why Conservative leaders failed to get behind Mike during the primary but they are demanding Mike give commentary for them. Mike said it had to deal with the way the money was flowing. Some of it will be explained in his new book. He was very frustrated especially with the way it was covered and that it was all about the money instead of the issues. Candidates are now echoing Mike’s stances on the issues after he was laughed off the debate stands for having them. 10:45 – ANOTHER BREAK IN THE ACTION – Wow what a great show so far. Mike is doing a fantastic job! 10:51 AM – Mike is back. Joe Biden has released 10 years of Tax returns. and not much of it was donated to charity. Anthony asks how the media became so biased. “There is no such thing as pure unobjectivity in the media” Mike says that if he read an article written about himself andh e couldn’t tell if he was a supporter than that is a good journalist. The next caller, Fabian is a Democrat and explained why he was a supporter and that because the GOP nominee is not him will be voting for Obama. Mike will not press his luck and try to change his opinion and Mike respected his opinion. 10:57 – END OF THE FIRST HOUR Phew! time to rest my fingers for a few minutes. I am really impressed with Mike’s radio skill and that he is talking about issues that are most important to us average everyday people. I should not be surprised and I am not because this is what endeared me to Mike throughout his Presidential campaign. 11:07 AM – START OF HOUR TWO “The phone lights are lit up like a Christmas tree!” Mike read an E-mail and got a chance to explain that the Government shouldn’t force the companies to line up their salaries fairly…it should be up the the boards instead of the Government will take care of it because of public demand. Mike does not want Government regulating it at all. “That will only make the problem worse.” “That is why we need the FairTax.” Mike said. The next caller spoke about Ike and then the FairTax. Mike said not only do we have to deal with a free spending Congress but they are spending money that they don’t even have! Mike says that that is wrong! 11:17 AM – TIME OUT!! 11:23 AM – Mike is back on the air after the commercial break. People are lining up on the phone lines. Great response to his appearance! Tina Fay’s spoof on Governor Palin on SNL. Mike said it was very humorous. the next caller, Ann wanted to talk about her. The far left feminists have been down right nutty according to Huck. “NOW is not a woman’s organization. It is a leftist, feminist organization.” they are hypocrites according to Mike because while they talk about how household duties should be shared that is exactly what Todd and Sarah do with their children. “the NOW should applaud them” but they don’t because she is conservative and pro life and doesn’t fit their ideology. “Sarah is drawing record crowds” Mike was not optimistic about his parties chances a few weeks ago. He did not see the base excited. They were not going to be involved at the grassroots level. However according to Huckabee, that has completely changed now thanks to Governor Palin! 11:28 AM – TIME FOR NEWS BREAK – Wow how the time just flies. We are now halfway through the program! INCREDIBLE! I wish Huck was on my radio everyday! 11: 35 AM – Mike is back on the air! More on Palin and the energy she has given to the campaign. 61% of Republicans are now more likely to donate money to the cause. Mike says that Governor Palin is authentic and she has run a small business and is the only person on a ticket that has signed a paycheck. “If I knew being a woman was so important than I would have run in high stiletto heels, lipstick and a wig!” Mike is very appreciate to us Georgians for giving him a big win on February 5th and attributes a big part of it to us, the FairTax supporters! I missed the last call typing. Sorry. I am surprised it hadn’t happened yet. I must be doing a better job than I thought I would. I am a fast typer but I have to go back to fix my typos a lot. Grace in Kansas is up next (mentioned Huck’s Army! Great plug) and asked about the black vote. Mike noted it is a big mistake to go to their community to reach out their hand in October. “They should start at the beginning.” the GOP doesn’t have to refine its message it just has to be clear from the beginning and reach out at the very start of the cycle. The preceived notion that all blacks are liberal is nonsense. there are lots of them that are conservative but they are not hearing from a lot of Republicans who think they matter or are authentically respected. The next caller, Dan wondered if a political commentator had to present his credentials publicly before an interview. Mike thought it was interesting and a good idea but said it will never happen. Mike says that the commentators were more interested in their own credentials while hosting the debates. That frustrated him a lot! 12:06 PM – Mike is back for the final hour of his fill in for Boortz. Mike says that Obama has been claiming that he is the agent of change and that he would bring a new breeze to Washington. Washington Times now claims that John McCain has been partnered 55% of the time with Democrats in the Senate over the past two terms. Take that! Mike is now joined by WSB Washington Correspondent Jamie Dupree. Dupree says that the state of New York now has a 5 percent lead for Obama (down from 18 %). Jamie Dupree agrees with Mike in that the establishment and the Washington chattering class are eating their hats on the Palin selection. Jamie thinks they are jealous and that people can identify with her and the more they look down on her the more the people support Sarah. Mike says at the convention there was a sigh of relief that Joe Lieberman was not picked. Mike even says he would not have spoken at the convention if McCain had done that. Than Governor Palin invigorated the delegates and energized the party base. Jamie Dupree says the bounce while it will eventually receded it will take a long time to do so – “Whomever wins three out of four between FL, MI, PA, and OH will win the election.” They went on to discuss the Charlie Gibson interview. There were many got cha questions and Jamie said that we in the media look bad when we ask those. In other words Gibson and ABC looks terrible for asking the questions that they did of Governor Palin. They both agreed that this has galvanized the Conservatives and it is working. They also agreed that Palin is now in Obama’s head and has really hurt him. Mike is criticizing both campaigns for not talking to the American people and focusing on the issues and neither have lately according to Mike. 12:22 PM – Mike is back from the break. Mike is talking about the Charles Rangle scandal with his tax returns. He helped write the current tax code and he screwed up on his returns. there are demands that he step down from the Ways and Means Committee. “Neal would not be as polite as I am to Charlie” My friend Lisa is now on the line and she asked about their (McCain/Palin) position about the FairTax. He does not know about Governor Palin’s position but that he hopes John McCain would consider it and he thinks he will and hopes he will support it. Mike would like to see the IRS out of business within the next few years and definitely in his lifetime. i missed the last caller of the half hour cause I had to feed the cat. Sorry. 12:35 PM – The last break for News is over and the last half hour of the show has begun. Wow. Time flies. “What would Neal Boortz do if he couldn’t find anyone good to fill in for him when he was gone? 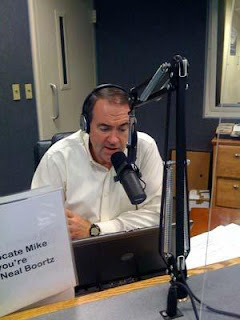 He got me!” Mike hopes to get Sarah Palin on board wit the FairTax as a response to a caller in North Carolina. The next caller wishes that every time Obama said change that people would hear “towards socialism”. Mike agrees and while Obama wants change he doesn’t advocate change that he wants or that we need. Mike ran into a small business owner last night and she is worried about Obama because his economic policy would kill her business. Mike understands and he agrees. Now he is advocating the FairTax for the 100th time today (it seems). He is talking about the New Hampshire stump story about the 2nd job someone took to help her job and that it wasn’t helping because he was basically being taxed everything from that 2nd job. where he noted that the only way he could get assistance for his daughter would be to quit both jobs. Mike is now taking a deluge of calls and it is hard to follow. Many of them are talking about the FairTax and/or people are hailing Mike and telling him that they voted for him. One caller commented about the bias in the media and Mike said the only way it will stop is if the ratings and money go away and mentioned that MSNBC is now tanking because of their bias. Mike doesn’t want Government to regulate it and he supports free press. 12:46 PM – FINAL COMMERCIAL BREAK One of the many soldiers in Huck’s Army is recording the show and will be splitting it up by segment. Stay tuned for those. 12:52 PM – FINAL SEGMENT BEGINS – Mike says thanks to Neal’s staff for helping him and for helping Neal and to Neal for supporting the FairTax. Here comes another deluge of calls. First topic up is offshore drilling. Mike is explaining that there is not as much environmental concerns to get oil today than there once were. Mike says we need energy developed of all types. Mike is next asked about the cabinet. Mike doesn’t think he will be asked and is not really interested. H wants to stay out there to help push the issues important to him. “Never say never though” The last caller asked about Obama and why he did not donate much money to help education initiatives. Phew. I’ll have more and add to this later in the coming hours and days. I am going to get lunch now. If you missed it there are some affiliates that run the show on tape later and WSB plays the show back from 1-5 AM the next morning. So he would be on from 2-5 AM if you are up at that ungodly hour. Thanks for hanging around with me for the past three hours. It’s been a pleasure enjoying the show with you. Our Mourning is short lived!!! Our preference for John McCain’s Vice President, Gov. Mike Huckabee was not selected!!! We were disappointed, and could not figure out why John McCain didn’t “get it”,…”get” what things Mike would bring to the ticket. But, after seeing and hearing Gov. Palin at the roll-out event in Dayton, Ohio, at the O’Fallon, MO rally, and last night at the RNC in MN, we know know that…John McCain made a great executive decision in picking Gov. Palin to be his Vice President!!! “I recall, last fall our conservative friend, Glen Williams from Alaska contacted me and wondered if there was anything I could do to get Governor Huckabee to come to Alaska. At the time, I was working as a Regional Coordinator for Mike here in Iowa. Glen told me a little about Sarah Palin (his Governor) and as I remember it…. said that she was a supporter of Huckabee and wanted to campaign with him in her state to generate more votes for Huckabee in the primary. I sent several e-mails to the campaign and made some calls to this end. At that time, Mike was extremely busy campaigning here in the main part of the nation. As I remember it, Janet Huckabee ended up going to Alaska in place of Governor Huckabee. For the past several days my attention has been focused on Hurricane Gustav. It was really looking mean a few days ago. At one point it was nearly a Cat 5 storm but that was about 48 hours ago. I have been monitoring the storm by listening to WWL radio in New Orleans. Right now it is barely a Cat 3 as the storm is poised to make landfall in Louisiana. It does not appear that Gustav will be as bad as Katrina however no one should let their guard down because at one point during Katrina we did and it suddenly became a much worse situation. Big ups to all involved in prepping the Gulf Coast. Preparations have been much more organized than they were just a few years ago. Millions of people were evacuated out of the area in a very short time. As for the RNC Convention, activities have been scaled back except for those that are required by law to start the convention process. All the speeches have been canceled today. Everything else going forward depends on what happens on the Gulf Coast and how much damage is done. Kudos t Senator McCain and the planning committee for staying on top of it and being very respectful.